It’s no secret that SXSW is arguably the largest annual musical and entertainment festival on the planet. Perhaps the most exciting aspect of this collaborative event, is the eclectic entertainment its’ showcases represent. From HOV himself to up and coming artists such as, James Bay, SXSW has something for fans from all walks of life. That being said, on Saturday March 21st, SPIN magazine and AXE for men coordinated the exclusive AXE White Label Collective Party; a showcase made up of performers such as YG, ASTR, James Davis and the one and only, John Legend. The showcase took place at Cheer Up Charlies on Red River Street in Austin, Texas. 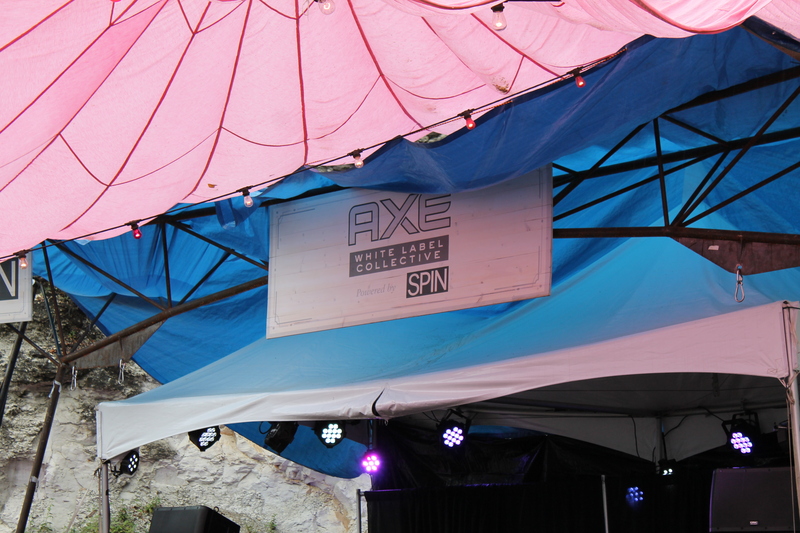 With an outdoor space sizable enough to accommodate supporters of all the featured acts, yet adequately intimate, ensuring everyone had a prime view of the main stage, about 500-700 music enthusiasts made their way into the unique venue. ASTR took the stage first. A NYC-based electro pop/punk duo with dimensional female vocals over a male driven beat. Their debut project, the Varsity EP, inspired their addition to the White Label Collective party, but the spacey couple performed at least two new songs exclusively for their Texas audience. With catchy hooks over simplistic beat drops, ASTR does a great job at making unique music with commercial appeal. The king of current RnB himself, John Legend, introduced to the stage the five AXE White Label Collective artists that he himself has mentored. In tandem with SPIN’s mission to promote new music, White Label Collective itself is a music, fashion and talent hub that fosters the growth of emerging artists. Legend handpicked the up-and-coming talent that would take the stage at this showcase. Alejandro Palma (YouTube: palmapurple) sang one song while showcasing his keyboard skills. The song “satisfied” that he performed live was the same song that initially caught Legend’s attention and ultimately landed him a spot on the Austin stage. With a good voice, cool hair and jazzy confidence, Alejandro used his time in the spotlight to show the SXSW corner of the world why he deserved to be heard. Allison Mula (YouTube: allison mula) said in her White Label interview that she realized she was “ready to #taketheleap” (the White Label hashtag for their talent scouting contest) when she got tired of standing still. With a funky appearance resembling a lunch lady from your grade school days and an eerie voice that would make Judy Garland seem current, Mula is bringing an old vibe to contemporary music. John Rankin (YouTube: johnrankinmusic) took the stage with acoustic guitar in hand. A short guy with a cool voice who, despite the pitchy areas of his set, mellowed out the anxious crowd and used his songwriting abilities to translate raw emotion. Reminiscent of an early Adam Levine, John has the indie ability to transfer emotion with his music. The favorite of the five seemed to be John Russell – self-titled on YouTube; this Detroit native brought the house down and was surely one of the only SXSW acts of the day to play the guitar in a black suit. Seemingly too young to have the raw vocals he portrayed, John brought truthfulness to his performance with no visible nerves. His musical influences shine through as notes of John Mayer and Ella Fitzgerald peak in between the lines of every chord progression. A nice change of pace to the showcase was Jelani Sinclair (YouTube: jelanisinclairpro), a hip-hop artist from Pomona, NY. Clearly influenced by the greats such as, Nas and Kendrick Lamar, Jilani brought on the head nods with his story rap stylization. On top of just saying the words, he made sure to feel them and show that emotion to all 500 people waiting to grasp his story. 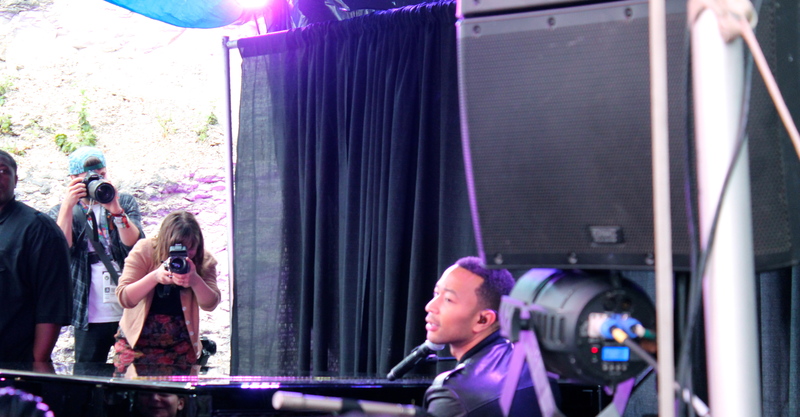 John Legend capped off the White Label artists portion with a four-song set that actually made female fans pass out from excitement (it was either that or dehydration). Constantly encompassing new elements in songs we’ve heard a thousand times, Legend managed to perform “All of Me” and “Ordinary People” as though they were being heard for the first time. These are two classic Legend tracks that have been heard hundreds of times by every fan in the audience, yet he is able to evoke a deeper emotion every time. The classics never seem stale with Legend, which is most likely why AXE thought he would be the perfect role model for their brand new artists. Music isn’t about constantly being innovative; it’s about reworking what already exists and making it more real. If it’s not broken you don’t fix it, you just protect it. Emotions have been the same for years, they revolve around happiness, sadness, anger, and love, changing on by variances based on situations and generations. The same goes for music. A classic song remains classic because every time it is heard, it has the ability to speak to someone for the first time. It seems that happened a lot on Saturday with the emerging talent at the White Label Collective and I’m sure everyone is looking forward to hearing more from the artist’s who took that stage. Alejandro’s youtube is palmapurple not pama. Thank you Danny! Must’ve been a misprint. Good catch!